India, with nearly 3.3 million sq.km. geographical area, is endowed with natural resources such as forests, crop lands, water resources, minerals, wetlands, snow and glaciers etc. The accurate information on the availability of natural resources and their optimal management is vital for sustainable development and overall socio-economic growth of the country. Resourcesat series of satellites, with a unique 3 tier imaging capability, have created its own ‘niche’ in catering to multitude of applications, specifically in the area of land and water resources management. The first satellite of Resourcesat series, Resourcesat-1 was launched in the year 2003 followed by Resourcesat-2 in year 2011. Resourcesat-2A was launched in December 2016. It carries high-resolution LISS-4 sensor with 5.8 m spatial resolution and a five-day revisit capability; medium resolution LISS-3 sensor with 23.5 m spatial resolution and a coarse resolution AWiFS sensor with 56 m spatial resolution. All three payloads AWiFS, LISS-III and LISS-IV sensors are operated to acquire multi-resolution data over India and surroundings. Resourcesat-2A has been added to the fleet of Resourcesat series of satellites in order to deliver high quality images to generate consistent data products. With Resourcesat-2 and Resourcesat-2A together in orbit, the revisit capability has improved to 2-3 days for AWiFS, 12-13 days for LISS-3 and 25-26 days for LISS-4. Combined revisits of Resourcesat-2 & 2A along with other satellites are useful in many ways for various applications. Resourcesat-2A data products, namely, radiometrically corrected system level products, Geo referenced terrain corrected and Ortho-rectified products were released for the user community from May 06, 2017 onwards after all the mission tests and calibration/ validation. Resourcesat-2A provides continuity of data with higher temporal resolution (therefore more cloud-free data) for various operational applications, namely, crop production estimation, forest cover mapping, mapping and monitoring land & water resources, environmental applications, rural & urban development plans, geological applications, disaster management support etc. The typical advantage of improved revisit as a consequence of Resourcesat-2 & 2A constellation is extremely useful for monitoring vegetation and water resources. The inputs for operational programmes, such as, Crop Monitoring, Horticultural crops assessment and development, Periodic water spread maps, Watershed Development projected care ensured with improved temporal resolution. New initiatives, such as, crop insurance, multi crop inventory and near real time disaster management support etc are ably supported. 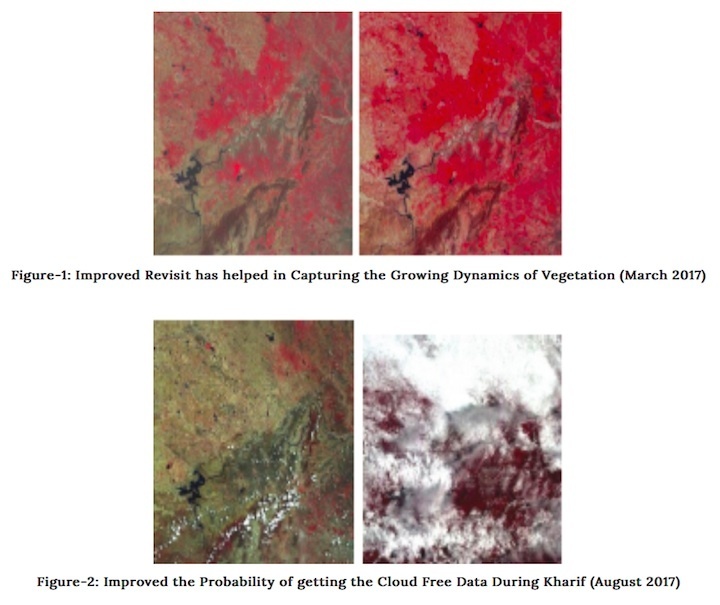 The growth of a typical annual crop (120 days) during kharif season can now be captured in 10 scenes instead of 4 to 5 scenes, thus improving the chances of getting cloud free data as well as improving accuracy of estimation of area and productivity models. This helps in better selection of bio-window for vegetation studies. Figure-1&2 illustrate the advantages of improved revisit of Resourcesat-2 & 2A as a constellation. Monitoring of crop parameters and biomass require high temporal resolution satellite data to capture changes in crop growth. The models with temporal algorithms could be applied in different themes. This would help in better crop discrimination and monitoring of minor crops, as they are predominantly cultivated with overlapping crop calendar. The phenology of forests can now be captured at better than fortnightly intervals. Using Resourcesat-2 & 2A LISS-III data provides opportunity in rapid forest monitoring and its management and conservation of forest resources. This data shall also help in frequent monitoring of water bodies especially with respect to water spread. Alluvial rivers in India deposit sand and suspended matter over the time forcing rivers to change their course. Gandak River flows across the floodplain of Bihar and merges with Ganga River near Patna. Remote sensing data of IRS series of satellites since 1989 along with Landsat provided unique observations on changing course of Gandak River near the confluence of Ganga during lean flow. 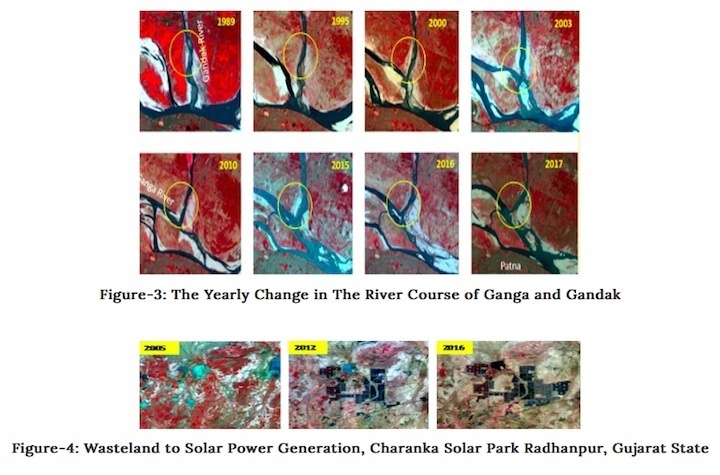 The Figure-3 shows the changing course of river Ganga and Gandak near Patna, India. Availability of LISS-IV data in about 25 days is making many new applications possible, namely, improved orchard inventory etc. ; Peri-urban horticulture mapping is another important application as it provides important input for price fluctuation/ volatilisation issues. With these data, now mapping of natural resources would see improvement in quality as more classes would emerge or could be better discriminated. Under Natural Resources Census (NRC) project, Resourcesat-2 & 2A LISS-III data have been used in Land Use / Land Cover Change Mapping and Wastelands Change Analysis (Figure-4) on 1:50,000 scale. With respect to rural regions, the monitoring of Integrated Watershed Management Programme (IWMP) could be done more frequently than before as LISS-IV data along with Cartosat-1 data are used to monitor the changes in IWMP watersheds. About 8,200 such projects are to be monitored over a period of 5 years. About 2,000 LISS-IV products are needed annually for the study. 8,200 Projects are being monitored in the country and 2,500 scenes of Resourcesat-2 & 2A are being procured every year for the study. Example for Monitoring of Microwatershed in Prakasam Dist., of Andhra Pradesh is shown in the Figure-5. The improved availability of Resourcesat-2 & 2A data is useful for disaster monitoring, especially for events like flood mapping and monitoring at village level and damage assessment. The specific advantage of having constellation of Resourcesat-2 & 2A is shown in the Figure-6. 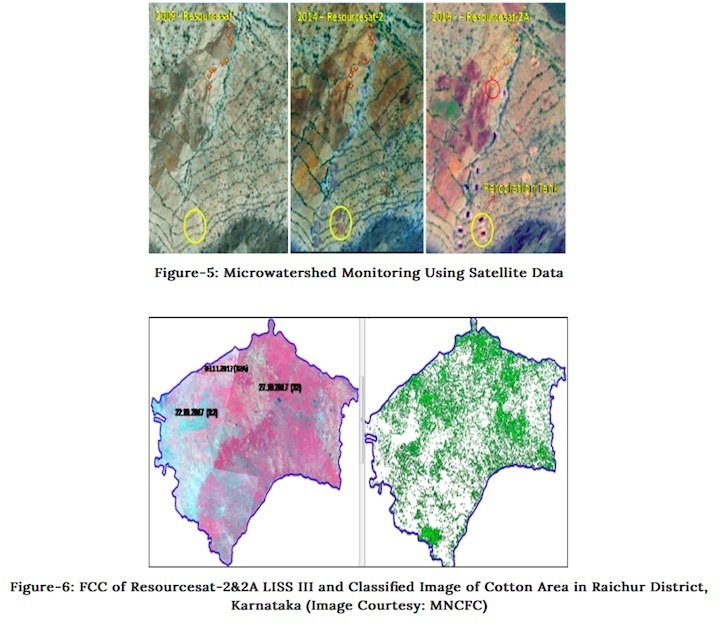 The figure shows the image generated by combining the data from Resourcesat-2 & 2A and right image shows classified cotton crop of Raichur district, Karnataka. The data of top left corner was generated from Resourcesat-2A (03/11/2017) and of the same path as Resourcesat-2. The figure indicates that if Resourcesat-2A was not there, we would have missed the top left part of the data and next possibility was on 15/11/2017 (Resourcesat-2) and by then cotton crop would have senesced or harvested. This would have led to uncertainties in estimation. 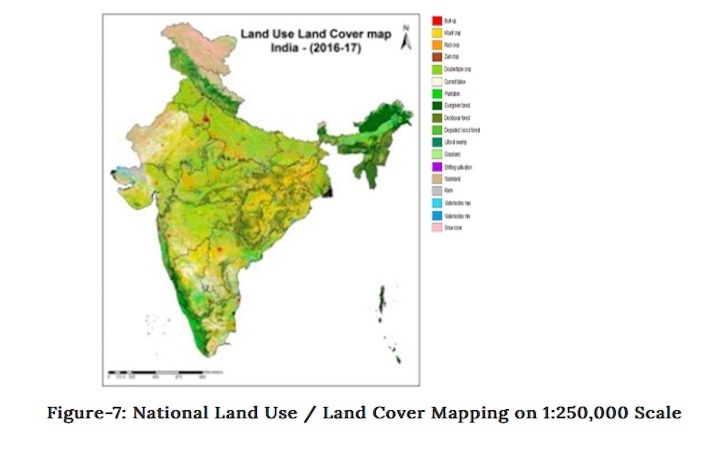 National Land Use / Land Cover mapping using multi-temporal 55 m spatial resolution satellite data, was initiated in the year 2004-05 and 13 annual cycles of assessments have been completed till 2016-17 using Resourcesat-2 & 2A satellite data (Figure-7). This gives unique ability to analyse decadal changes in land use and land cover and also to improve upon ground level practices for better natural resources management. Thus, the Resourcesat-2 & 2A has added new dimensions towards improved use of remote sensing technology in the country.